You can use this list to build up your knowledge of Spanish words. It is a comprehensive list fully illustrated with examples of the words in English and Spanish to give you a good idea of how to use the word. 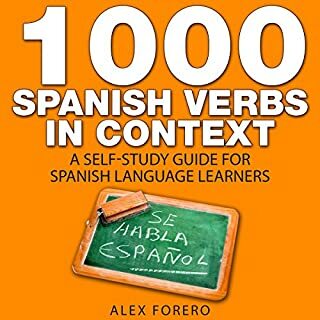 I’ve chosen to review “1000 Spanish Words in Context”, and “1000 Spanish Verbs in Context” because the two work really well together, and because you ought to buy both of them. The 1000 Spanish Word sentences all contain verbs, and the 1000 Spanish Verb sentences all contain vocabulary words. Taken together, that’s over 2200 sentences of practical Spanish dialog. It’s easier and more interesting to listen to Spanish vocabulary in sentences, and what you hear sticks with you much better. The Spanish-speaker does an excellent job of conveying the emotional content of the sentences, and emotional content is a powerful force for learning and remembering. Most courses in Spanish like to indulge themselves in what they call, “spaced repetition.” That is, they spend a lot of time going back and repeating material you’ve already covered. This is supposed to help you remember better. The result is they may sell you a 4-hour course, but only 1-hour is new material - the other 3-hours is a rehash of what you’ve already covered. The Alex Forero books are different. Each of the 2200 sentences is unique, although they all draw on a (large) common inventory of Spanish verbs and vocabulary words. Due to the concentrated nature of the material, you won’t be able to go through it as quickly as you would a less concentrated course. But you’ll learn a lot more. You can replay the recordings as often as you like, being confident that you’ll continue to learn more Spanish as you do so. The sentences use a lot of different constructions, so you’ll get a lot of practice with Spanish grammar along with the vocabulary you’re learning. There are a couple of things about the books and recordings I would have changed. To begin with, the Spanish sentence comes first, followed by an English translation. I would have preferred the English first, so that we could make a stab at our own translation, and then we could listen to the Spanish-speaker. This would help us with our sentence formation and pronunciation. Also, in “1000 Spanish Words” (but not in “1000 Spanish Verbs”), the Spanish word is given, followed by the English translation, followed by the Spanish sentence, followed by the English sentence. I found this boring and repetitious. 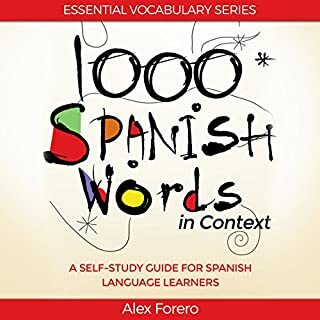 I would have much preferred that “1000 Spanish Words” follow the same pattern as “1000 Spanish Verbs”, where the Spanish sentence is printed with the highlighted word in bold type. It’s easy enough to figure out the meaning of the word from the English that follows. Learning a new language is never an easy task, but it doesn't have to be hard. By learning the 1,000 most-used verbs in a language, you give yourself a fantastic foundation to start building upon to your road to fluency. English phases should have been first. Listeners learn pronunciation, vocabulary, and grammar of Spanish without the need of a textbook. Level 1: Key words and phrases, basic grammar skills, emphasizes travel needs; Level 2: Expands vocabulary, new grammar concepts, more day-to-day activities; Level 3: Broadens vocabulary base, more advanced grammar skills, enriches conversational ability. 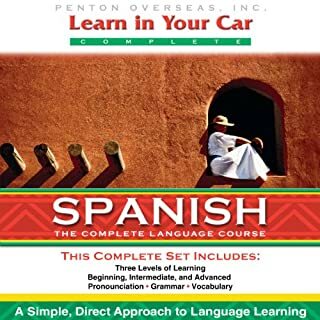 What did you love best about Learn in Your Car: Spanish, the Complete Language Course? 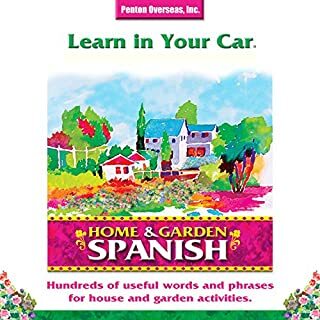 I originally purchased Learn-in-Your-Car Spanish back in 1997 when it came out on cassette tapes. The Audible version is a really nice improvement. You can slow it down, skip forward or back, or pause the playback. I was pleased to note that after almost 20 years, I can still respond to the English cues in passable Spanish. There’s something about the method of presentation that really helps the material stick in your head. There are 2500+ entries, starting with simple words and phrases, and then sentences becoming progressively longer and more complex as you progress. Along the way, you cover all the basic verb tenses and moods, with practice sentences in the 6 person types for each tense and mood. There are a number of other topic covered, such as direct and indirect object pronouns, reciprocal constructions, etc., etc. All these various constructions are used in sentences relating to topics such as eating, shopping, travel, computers & technology, etc., or just general conversational chit-chat. I have to admit I didn’t follow the instructions about repeating a lesson several times before going on to the next lesson. Besides being boring, it was hard to find the beginning of the lesson on the cassette tape. Instead, I just plowed ahead, repeating the sentences as best I could. I actually did learn the sentences this way. Maybe that’s how a Spanish kid learns. When his mother yells, “Callate!” he knows to shut up without considering whether his mother is using the second person singular form of a reflexive AR verb in the imperative mood. I highly recommend the accompanying PDF file. It’s rather lengthy, but invaluable as a resource. All the sample sentences are printed out. In addition, there are really great sections explaining the various grammar points illustrated, and presenting easy to understand charts of verb conjugations and other useful information. The PDF file makes a very nice book of Spanish vocabulary and grammar.